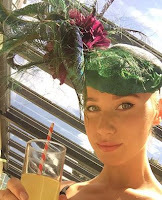 Suzie's Creative Style Blog: Galway Racing Festival Week - Events with Style and Hats!! Galway Racing Festival Week - Events with Style and Hats!! Events with Style and Hats! What a week there is planned throughout Galway for the Galway Races. There is so much on each day at the Race Course and also each evening. The city will be buzzing for the week. Here's a list of some of the special events planned where you can wear your beautiful hats and racing style. Prosecco reception, followed by a four course lunch with wine and style and fashion showcase. MC for the event is Noel Cunningham, TV3 showbiz correspondent and best dressed male and female will be judged by style guru Marietta Doran. Tickets for the event are €65 and include racecourse ticket and bus to Ballybrit at 3pm sharp. Tickets can be purchased from the Salthill Hotel on 091 522711 or from Enable Ireland on 091 545800. Guest MC Lorraine Keane will take us through the latest trends and stunning styles kicking off at 8pm followed with a best dressed competition in Busker Brownes Bar & Kirbys Restaurant judged by Lorraine Keane and Fashion Editor of Evoke.ie Aoibheann Mc Bride. One lucky lady will walk away with vouchers worth 2000 to spend in the Latin Quarters. Xposé's Lisa Cannon, Claudia Gocoul and Triona McCarthy will be popping in and out of all the bars, restaurants and stores throughout the Latin Quarter selecting finalists as they go for best headpiece and accessories. The finalists will be invited to a party in the House Hotel where one lucky lady will be chosen. Wednesday/ The Connacht Hotel Marietta Doran will be pick the Best Dressed Lady on Wednesday from 8pm with the help of one of Galway's top bloggers The Beauty Kemple make sure you're in for a chance to win. • The five judges will walk around the racecourse through the crowds and invite a select number of chosen finalists to the Ladies Day g Hotel Best Dressed Marquee, adjacent to the Champagne Marquee, near the parade ring. • Finalists must immediately make their way to the g Hotel Marquee. The finalist badge is required for entry of the g Hotel Best Dressed Marquee. • 2.30pm: all finalists gather in the g Hotel marquee for an informal chat with the judges. Music by Cafolla & Engel/Dancing til Late ....... Event in aid of Irish Injured Jockeys. 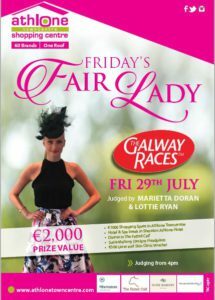 This promises to be the highlight of Galway Race Week social calendar with live music entertainment. For tickets contact Nuala at Galway Bay Golf Resort 091 790711 or sales@galwaybaygolfresort.com. Dining with complimentary prosecco in Restaurant gigi's - Bubbly Tipster Brunch hosted by Ruby Walsh & Katie Walsh - Live Music from The Supernovas – Cafolla & Engel – The Good Hustle Big Band – Spring Break 80s Band - the famous 'Best Hat' Competition on Ladies Day with Philip Treacy Prize [#gBestHat] - the 'Most Stylish Man' event with €1,000 strellson suit from Hanley’s Menswear [#gDapperGent]. For Cocktails – Dining – Fashion & Fun - the g is the place to be during Galway Raceweek! Sponsored by Fallers Jewellers, this year’s "Most Stylish Lady" competition boasts a coveted first prize fund of €1,500 worth of stunning jewellery and a second prize of fund worth €500 for the runner up. Judges: TG4 Rugbaí Beo presenter Máire Treasa Ní Dhubhghaill alongside Mandy Maher, owner of Catwalk Modelling Agency and leading Irish model Mary Lee. Style never goes out of fashion in Halo & this Ladies day Ireland's top model, blogger & “Natural Born Feeder” Roz Purcell will judge our Best Dressed Lady competition. Former Miss Universe Ireland, Roz will be on the lookout for the most stylish, elegant and glamorous Lady in Halo on Thursday night with a designer handbag from Brown Thomas worth over €1000 for the winner. As we love our stylish men too we have a timeless timepiece from Hartmann’s Jewellers with our Best Dressed Gent winning a stunning Tissot Watch. Clayton Hotel Best Dressed Lady and Gentleman Competitions for the evening. The best dressed lady on the evening will walk away with a €1000 shopping spree in Athlone Towncentre, a luxury hotel & spa break at theSheraton Athlone Hotel, a delicious meal for two in award winning restaurant The Fatted Calf, a €300 voucher to spend on treatments in The Laser & Skin Clinic in Athlone Towncentre and €250 voucher for a bespoke headpiece crafted by Suzie Mahony Designs. Fantastic choice for everyone all week in Galway. I've been to events at other places, but this was my first time in here. Great place. Food was good and seating was very comfortable. Also, very good view from where I sat. This is such a cool LA venue and the atmosphere was equally amazing.